My favorite childhood toy was Barbie. Barbie dolls opened a world of imaginative play and socialization with other girls, like my sister. My mom loved Barbies when she was a young girl, and she gave us one of hers - a classic with red hair and curly bangs. My sister and I added many more Barbie dolls and accessories to her original doll. When asked by RocketMoms about my favorite childhood toy, I decided to share my childhood love of Barbie and how she came with me in adulthood. 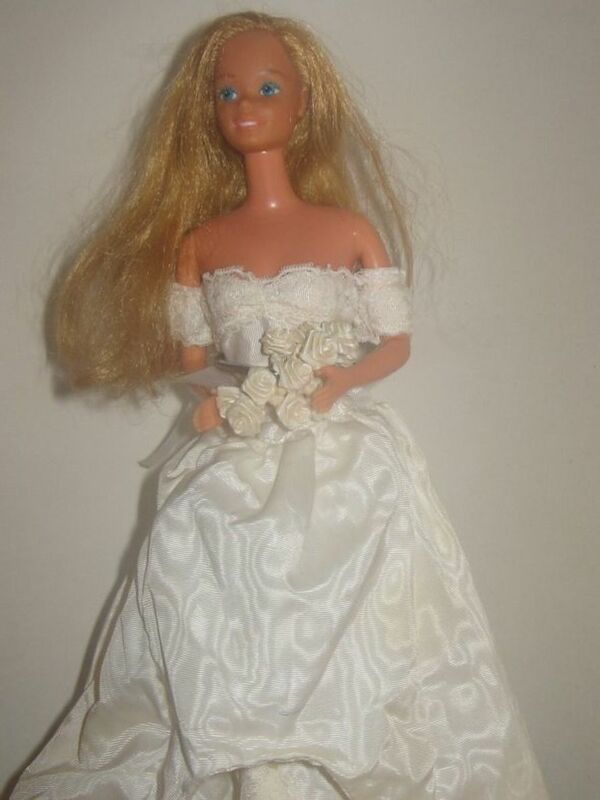 Photo image is of my childhood barbie, a special bride. One time, I decided to radically change the appearance of my mom's Barbie. From all the years of play, my mom's red-haired Barbie was losing chunks of hair. She had softer hair than my dolls, and I tried to do 'comb-overs' and buns. She still didn't look good, in my eyes. So, I cut her hair into a bob. I was fine with her cropped hair, though I'm sure my mom cringed with the new 'do. By the way, if you want a great idea on how to fix Barbie's frizzy hair - which happens over time -- visit: Housing a Forest, where Tammy gives a how-to time on straightening Barbie's hair - love it! Now that I know the secret, I'll have to fix my wedding Barbie's hair, which is a bit frizzy. My sister and I enjoyed playing Barbies together. 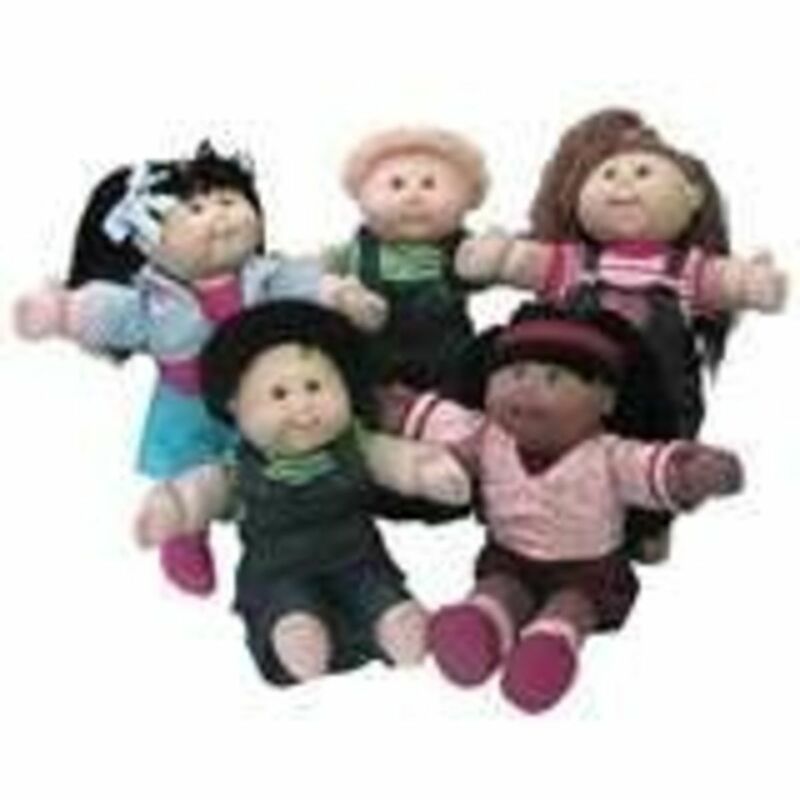 We had our own dolls, but we shared accessories, like houses, cars, and bigger items. I had a wide variety of clothes for my Barbie dolls. My mom used her sewing talent to create new fashions for our Barbies. 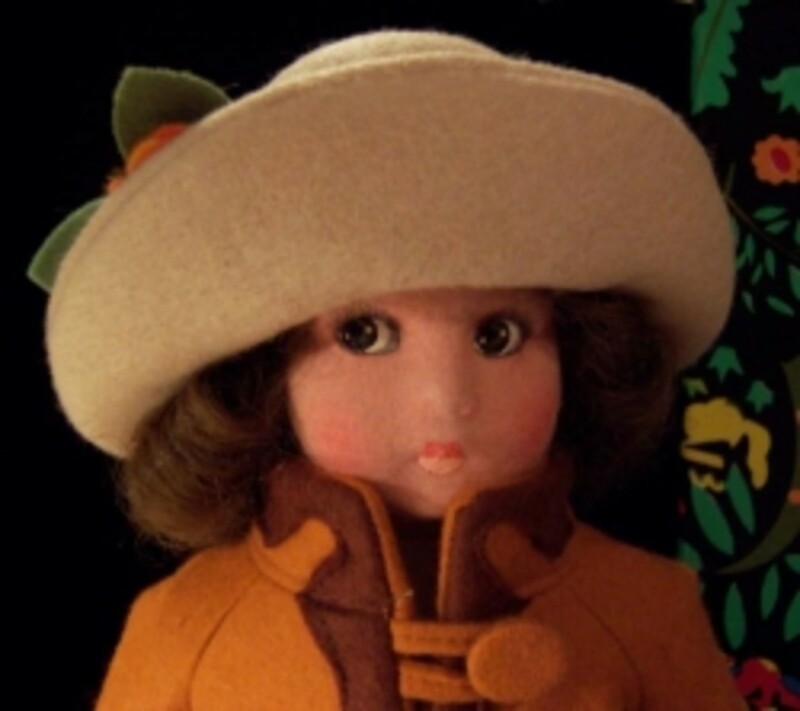 Since my mom sewed dolls and stuffed animals as a part-time hobby/job, she had plenty of extra material to design super dresses, coats, rugs, etc. She enjoyed making new clothes for our Barbies. Since she sewed a variety of items, she had leftover material, perfect for our make-believe dolls. One time, she used the leftover material from a shaggy, stuffed dog to make a fur bedspread for our doll's bed. She'd tell us to pick the 'basic' doll because she could make new clothes and the extras. We moaned that we wanted all the accessories, but she'd remind us that those impossibly tiny earrings and shoes would always get lost. I would've loved this Barbie when I was young. Instead of irreparably cutting off a doll's hair, I would have enjoyed styling long and short hair on the same doll! This Barbie's hair 'grows' 8 inches with the touch of a button. Lots of stylin' fun! What Makes a Barbie Dreamhouse? I loved the Barbie house we had; it was a one story home with lots of rooms for Barbie to explore, eat, and sleep. It may have been a house from another type of doll, but the one I found online is similar to the one I had. My sister and I also had a Barbie pool, like the one shown here. You would've thought my sister and I were swimming alongside Barbie and Ken -- we loved setting up the pool for their "swim". It had a ladder and a slide, which was more exciting than a plain circle of water. Barbie needed a ride around our imaginative town, and so we asked for a Barbie corvette. We loved the Barbie car, which my sister and I had to share. Barbie drove and occasionally, Ken would hitch a ride. We had a nice Barbie family. We had quite a few Barbies and a couple Kens, but we also included sister Skipper and friends. 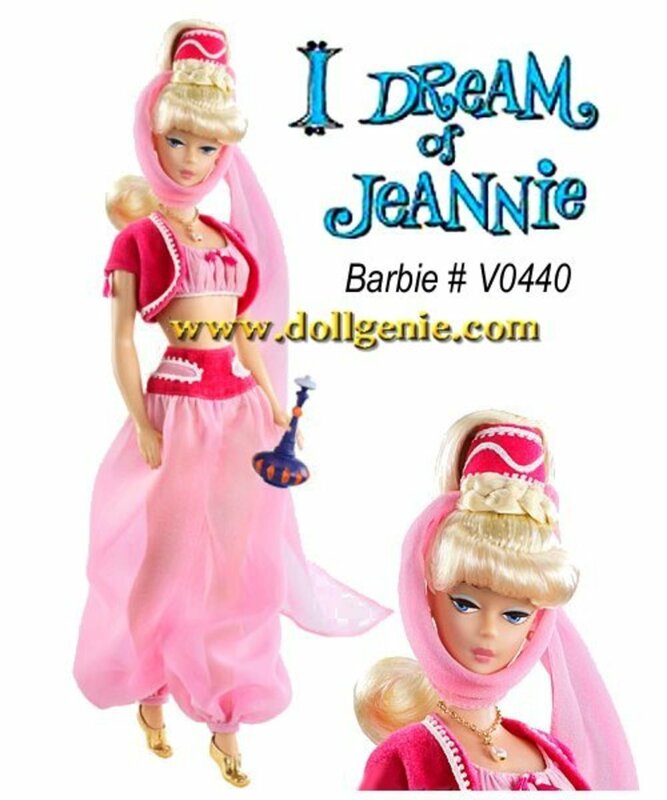 Do you have any favorite Barbie family dolls? Add them to the list! My sister and I would play for hours with our Barbies. We created huge "sets" and made up "lines" for our scenes. It wasn't all scripted, but it always included our pretend reality of adult role play. It was a chance to escape and explore, just like with other types of play. Even though we had Ken dolls, our Barbie life was very girl-centric. Our Barbies were go-getting, in-charge women. We "practiced" different careers, and we were definitely the ones making the rules. Ken was a partner, but Barbie wasn't a passive, trophy wife. On some school mornings, we were allowed to play with our Barbies before the time to leave for school. While we could play with just the doll, my sister and I really enjoyed setting up the Barbie house, car, and other accessories. One morning, we got so involved in our play time, we missed the time to leave for school! Since our parents were already at work, we always rode our bikes to school. We always left on time, except for that morning. I called and cried to my mom. She calmed me down, told me to get going to school, and didn't give me a hard time. I've never forgotten that morning (and I never missed the time again). It was easy to lose time when we started playing. What a wonderfully full and imaginative world we enjoyed with Barbie! Interesting interview on the reasons for Barbie's popularity for 50 years. It discusses the controversy of potentially turning girls into passive women with unrealistic body images and the importance of imaginative, free play for girls. When we "outgrew" Barbie, my sister and I decided to give them to kids who would enjoy our vast collection. Even though it had been years since I played with Barbie, I had kept one of my dolls. She was one of my first and my favorite. Barbie still held an appeal, as her new careers or fashion style would always catch my attention. I had fond memories of pretend play, where I'd imagine great settings, switch careers, and run my own adult life. I didn't realize this one Barbie would stay with me through a wedding, divorce, and beyond. My mom designed my wedding gown. It had a tight bodice and long, slim skit. Off the shoulder and a straight neckline. She wanted to make a big, pillowy skirt to go over the skinny gown. To give me an idea, she decided to make a replica wedding gown for one of my old Barbies. Once I saw it on Barbie, I loved it. My mom tried to make the full skirt, which was to billow and make a train. It didn't quite "work" on me, and I decided to stay with the original straight dress and no train. When my uncle decided he'd like to make a keepsake for me as a wedding present, he and my mom joined forces. She added even more to wedding Barbie, complete with a bouquet of roses and a veil similar to mine. My uncle found the doll display and a glass dome display. He nailed the doll display into the wood display base to give it more stability. I loved their wedding gift, and I've kept it ever since (though I divorced my first husband). My wedding Barbie reminds me of my youth, my hopes, my princess bride day, and the love for my mom and uncle, both of whom have passed away. My mom and uncle protected my wedding Barbie in a tall glass dome display. Over the years, I've taken her out and straightened out her dress or looked at the detail in her gown. 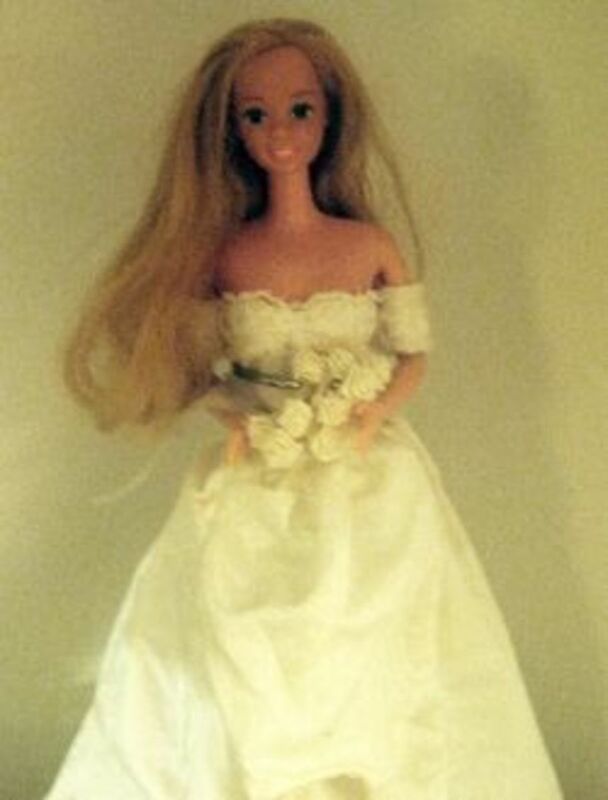 One time, I lent this Barbie to a little girl who was fascinated by the wedding Barbie. Even though we had the doll protected under glass, Barbie was played with before and after her "wedding" day. My mom found an inexpensive stand so Barbie would have the proper support in her wedding gown. The hooks on the stand fit around the doll's waist, and her hands and bouquet hid most of the metal. My uncle nailed the stand onto the display base to give Barbie extra stability. If you're buying one for one of your dolls, make sure the stand is strong enough to support your Barbie. Are You a Barbie Collector? I've always enjoyed seeing the latest Barbie dolls unveiled year after year. In 2009, Barbie celebrated her 50th anniversary! The holiday Barbies are also top of the line glam, with fully frilly gowns and jewelry. 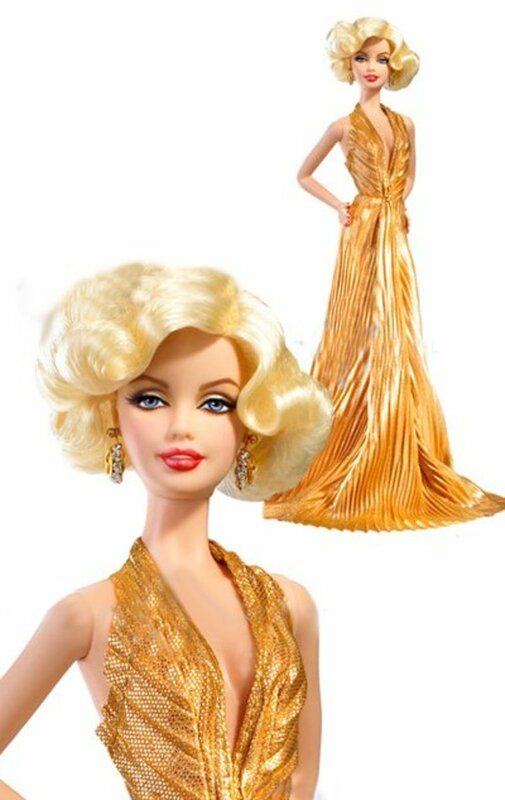 The 50th Anniversary Barbie is a replica of the original Barbie, and she's all decked out in glamour. The original teen fashion Barbie looks very similar to the one of my mom's (the one I chopped off her hair). Every year, you can find the latest trends or cultural favorites made into Barbie, like Twilight's Bella Barbie. Unfortunately, I haven't officially collected any Barbies; I can't avoid the temptation to open the boxes and check out her dress and hair. Maybe I should buy two: one to stay in the box, and one to "play" with? For Barbie fans who can keep her in the box, check out these latest Barbie collectibles. If you're a Barbie collector, check out the link below. You'll find out the latest news (including the 2010 releases), and be able to interact with other Barbie fans. A fun site, where you can definitely lose track of time. Did Your Love For Barbie Continue Past Childhood? @Erin Mellor: Aww, thank you so much! It was such a touching gift, and now means even more - as a reminder of my mom and uncle. Thank you for visiting and commenting! Your Barbie Wedding "you" is just a delight, what a thoughtful gift. @Cynthia Haltom: Oh, I am so sorry to hear that news! Have you started a new collection? Before hurricane Katrina I had quite a large collection of Barbies. Katrina has them now I hope she enjoys them as much as I did. 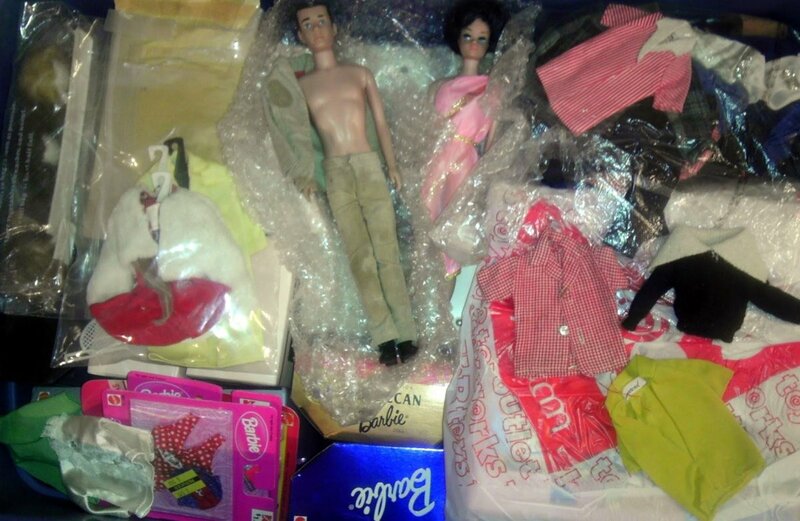 @infoprogirl: My friend started buying some of the limited edition holiday Barbies - and has them in her closet. :) Great to hear from another Barbie fan! Oh yes! I still love Barbie and my even have a few dolls in the attic:))! Barbie was too skinny for my tastes in dolls. My nieces had a lot of them. 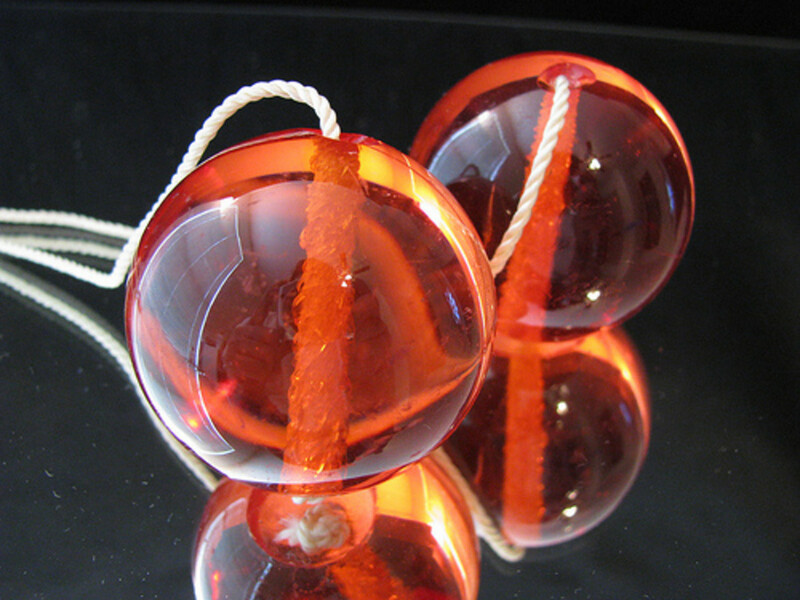 @ElizabethSheppard: So many neat memories with Barbies -- they topped our best gift list too! Yes, I love Barbies still. We used to fold the little cases back and make houses out of them. She was my absolute most favorite Christmas present ever. This is fantastic. Well done. I loved my Barbie more than you know. She was my fashion inspiration and first hair dressing victim. I still have her all these years later. Her hair has bangs but is still silky soft! Mum would make teeny tiny clothes for her. The cat would run away with them. Happy days. Thanks for the memories! loved barbies. used to collect. how do you become a rocketmom? 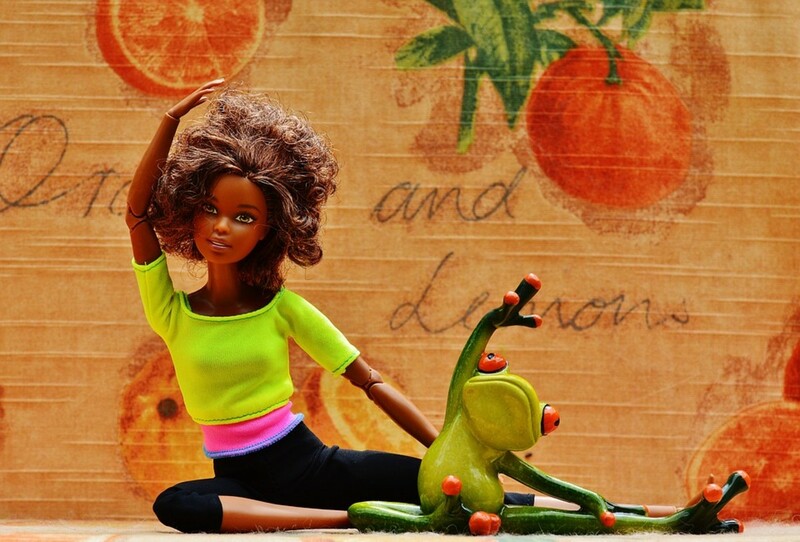 A wonderfully told story of your life with Barbie. I din't have a Barbie but do know about cutting doll hair and Mom making doll clothes. My Nikki had several Barbies and would spend hours with her hairdo's and other Barbie fun. Your wedding Barbie is lovely and a wonderful story to hand down. I just love your wedding Barbie! so much better than Bratz!